Last night Jacki and I went to go see 300 a movie recommended by our favorite waiter in Santa Monica. The movie tells the story of the 300 men from Sparta who fought to maintain their freedom from Xerxes in the 300's final stand based on the Battle of Thermopylae. 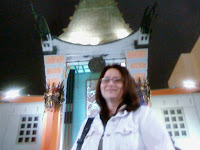 We saw the movie at arguably the world's most famous movie theater, Grauman's Chinese Theater. Behind the famous doors is one of the largest movie theater rooms I've ever been in. We saw the digital projection on a gigantic screen. Although I think Jacki and I still prefer the Arclight this was the most beautifully appointed theater we had been in. The movie itself was very violent with violence done in a way that combined elements of realism with a dark graphic novel look. As a result the movie's scenes came off a bit sci-fi with a look that you can tell was based on the original 300 comic book by Frank Miller and Lynn Varley. I enjoyed the movie however it didn't pull you in and make you feel for the characters. The emotion was entirely based on the thrill of the fight, and not for the loss of Sparta or any of the character stories they tried to develop. Once we left we headed over to the Knitting Factory to pick up Darian and her friends from a concert. The show hadn't let out when we arrived so we talked to the door man and he graciously offered to walk us up to the balcony area so we could see the final band and wait for the show to let out. That final band was the Slim Jim Phantom Trio, featuring Jim Phantom the drummer from Stray Cats. Very rockabilly, very Elvis, and very 50s, or at least what I think the 50s may have sounded like. The band sounded great and I was surprised to see how large Slim Jim's 2 piece drum set (snare, bass drum and 2 cymbals) could sound. On the way we had a little fun with the Beverly Hills Police at their drunk driver road block on Sunset. We hadn't had any drinks all night but we had a packed car with 4 teenage girls in the back. We were pulled over showed our ids, answered a few questions, and after they saw we hadn't had any drinks they let us go on our way. After that we dropped Darian's friends off and finally made it back home.